A Splash of Color-Free Shipping! 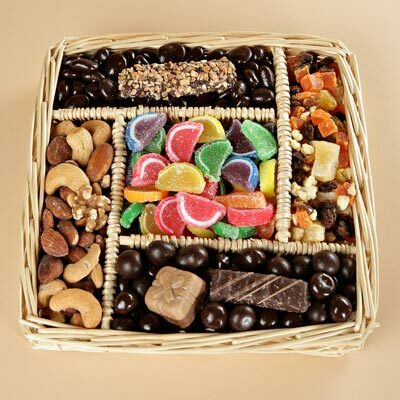 A wonderful wicker basket with a variety of five delicious treats including dark chocolate covered bridge mix, caramel, viennese crunch, fruit slice jellies, mixed fruit and nuts. A baby boy gift basket that has an adorable stuffed animal and delicious blue and white chocolates and jelly beans. An adorable gift that will welcome the new baby. Includes a cozy blue teddy bear, dark chocolates, an organza bag of blue jelly beans and pacifier candies. Local delivery only. A carousel of delicious goodies to welcome the new baby girl! Perfect for to welcome the new addition. 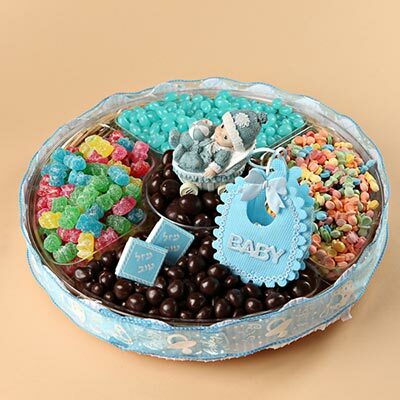 This gift is filled with delicious dark chocolates, pacifier candies, sour bears, jelly beans and topped with Mazel Tov chocolates and baby trinkets. 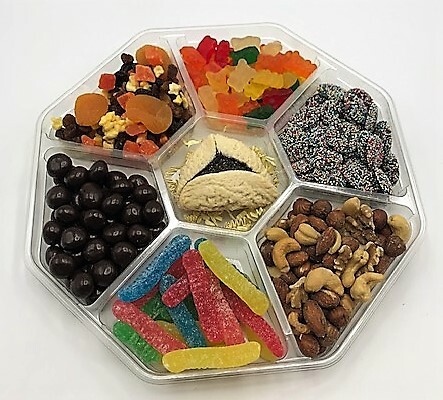 A delectable Purim tray full of favorite Purim treats - dark chocolates, gummy bears, sour worms, mixed nuts, fruit mix topped with a Hamantashen! A great mishloach manot! Free Shipping! 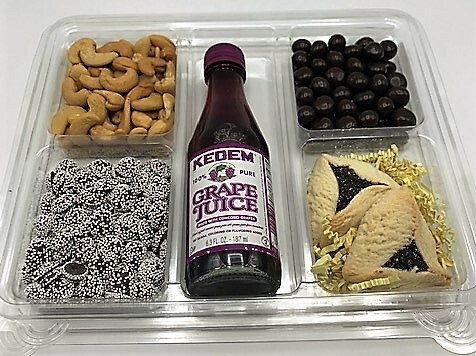 A great Purim tray of favorites - dark chocolates, roasted cashews, Hamantashen and yummy grape juice. A great mix! Free shipping! A great gift with something for everyone. 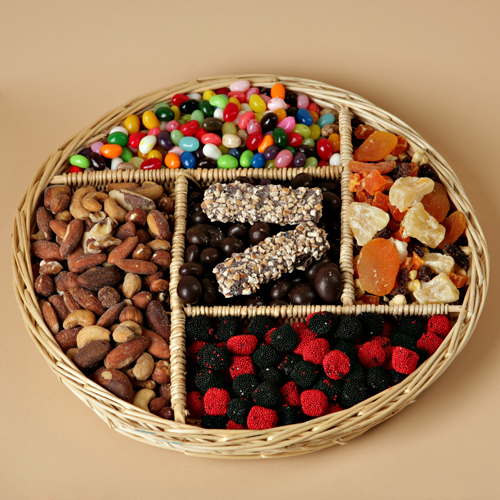 Two trays of delicious treats - chocolate and candy tray for the sweet lover and a tray of a healthy mix of fruits and nuts. Beautifully wrapped in cellophane and a bow! FREE SHIPPING! A carousel of delicious goodies to welcome the new baby boy! 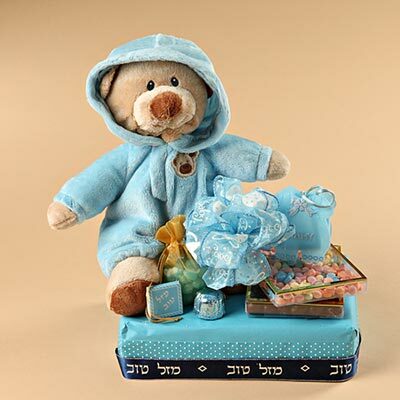 Perfect for a bris, shalom zachar or just to welcome the new addition. 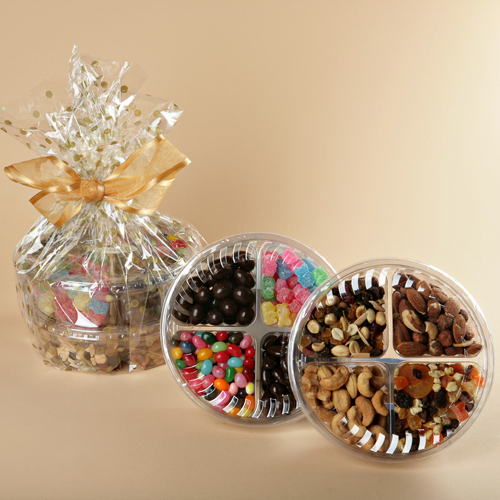 Thw gift is filled with delicious dark chocolates, pacifier candies, sour bears, jelly beans and topped with Mazel Tov chocolates and baby trinkets. Baby Boy Gift Platter- Free Shipping! 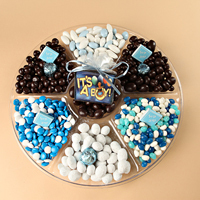 Blue and white chocolates, white powdered toffee almonds, jelly beans, jordan almonds topped with foiled and Mazel Tov chocolates makes this gift a popular favorite.